Rocko and Nakota Tales from the Land at the Victoria Fringe Festival 2018. An interview. Rocko and Nakota: Tales from the Land at the Victoria Fringe Festival 2018. An interview. You are here: Home / Arts / Rocko and Nakota Tales from the Land at the Victoria Fringe Festival 2018. An interview. 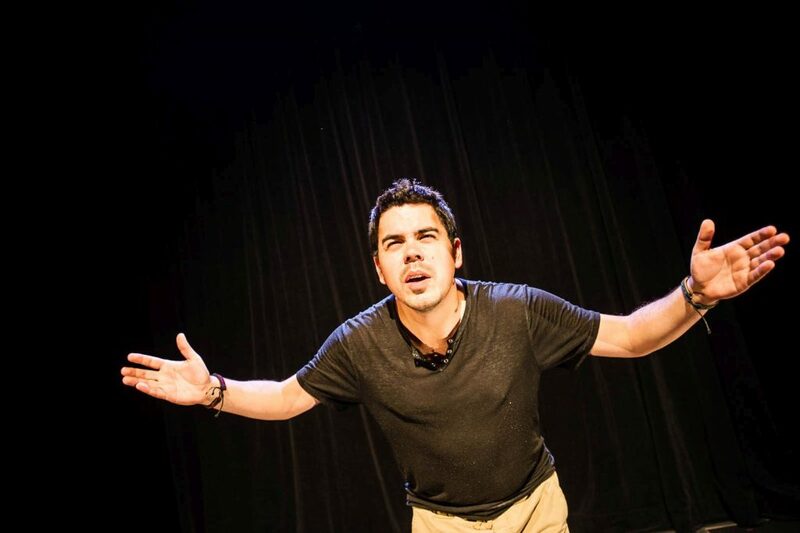 One of two plays centering Indigenous experience at the Victoria Fringe Festival 2018, Rocko and Nakota: Tales from the Land by Edmonton-based Anishinaabe artist Josh Languedoc is also the recipient of the CAFF lottery which allows entry into multiple Fringe festivals. I caught up with Josh on the road between Ottawa and Winnipeg. As an artist I have actually been directing/producing/writing/performing in Fringe shows on and off in Edmonton since 2005. These shows have ranged from collaborations to improv shows to children’s theatre to my own writing. However, this is the first time I have ever done a Fringe show as a solo artist. Yes. I was a rercipient of the CAFF Lottery, so I am touring this show to 6 Fringes. I will be performing in Ottawa, Winnipeg, Calgary, Edmonton, Victoria, and Vancouver. It is a new work in a sense it was developed this year. Before Winnipeg Fringe I have performed this draft of my show at Ottawa Fringe and the Thousand Faces Festival in Edmonton, AB. No awards. However, this show was placed on the “Top Fringe Picks” for Ottawa Tonight as well as APT613. This show began as a collection of indigenous stories told orally. However, the show was accepted into the Banff Centre’s Indigenous Storytelling and Spoken Word Residency, where I was given many cultural teachings around oral storytelling and tribal respect. I was encouraged to move away from a “traditional oral storytelling show” and to make it more personal. While in Banff I reflected and drew on personal experiences and discovered 2 inner characters of mine – Rocko and Nakota. Nakota represents my inner child and an inner stubbornness in some children, and Rocko is an elder guide of mine that I have had with me for my entire life. In discovering these two indigenous spiritual guides of mine, I began to dramatize several of my real-life experiences, and put Rocko and Nakota at the forefront of this dramatic tension. I then incorporated elements of oral storytelling into the show and developed it into a combination of a play and an oral storytelling show that is grounded in experiences from my life as well as traditional indigenous teachings. I worked with a few dramaturgs and had several trial runs at the Thousand Faces Festival in Edmonton before finalizing my draft and taking it on the road to the Fringe circuit. Anyone looking to be open to healing. I feel this show is ideal for anyone who has battled with their own health or cultural identity, or anyone interested in indigenous issues. It is also all-ages, so this is definitely a show that can appeal to younger viewers as well. This show is about healing anxiety and mental illness, which is something we all can relate to. Sometimes, the solution comes from an unlikely place. That you can find comfort in knowing you are not alone. That even in your darkest moments, someone will listen to you as long as you speak from your heart and reach out. I also hope to inspire people to consider the power of traditional indigenous teachings. Nakota is a young boy in Grade 6 trying to write a story for a school contest. However, this proves difficult when he becomes very sick in the hospital. While trying to write his story and master his own fear for his health, he has a visitor. His very old grandpa, the wily and elderly Rocko, arrives with one goal in mind – to tell him stories. Nakota’s journey into stories becomes a journey into himself as Rocko brings to life tales of the present and the past. Playing both characters and several secondary characters, Josh weaves a complex dynamic between young and old generations while examining contemporary contexts of stories, fear, and growth. Josh Languedoc has Anishinaabe heritage from Saugeen First Nations. Josh is currently the Playwright in Residence at Workshop West Playwrights Theatre and works as a writer, educator, and performer in Edmonton, AB. Josh has also worked with Native Earth Performing Arts, Concrete Theatre, Thou Art Here Theatre, Grindstone Theatre, and Walterdale Theatre. NOTE: This Production is part of the CAFF Lottery and was made possible through the support of the Banff Centre for the Arts Indigenous Storytelling and Spoken Word Residency, Kompany Family Theatre, and the Thousand Faces Festival.